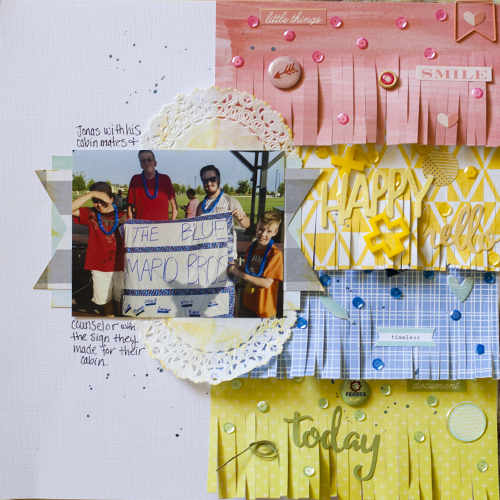 Hello, hello my scrappy friends and welcome to the SpiegelMom Scraps SCRAP IT OFF Anniversary & Design Team reveal blog hop! You should have arrived here from Tiffani’s blog. Isn’t her layout just perfect? I love how she used the sequins on it! I don’t know about you, but I am so excited about this event going on today! Jody is super excited to reveal the new Design Team, three new sequin mixes, a FREE cut file designed by one of the fabulous new Sparklers and prizes! If you’re just joining me here on my blog, be sure to check out the line up and all the other goodies over at the SpiegelMom Scraps blog here. So, If you haven’t guessed this already, I applied for the Spiegelmom Scraps Store Design Team and Jody, the owner, asked me to be on her team! I’m so super excited to be using and sharing her products with you all! Run on over to her store to check out her shop and grab some of the awesome sequin mixes!! 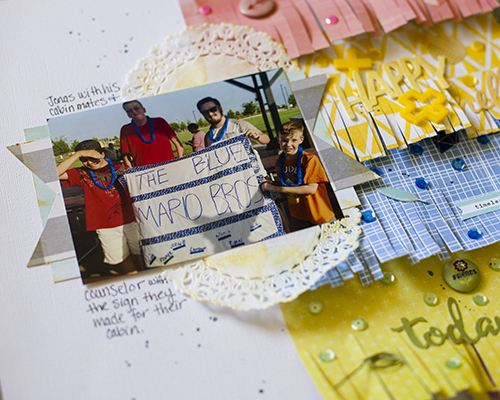 Ok, now that we got all of the blog hop and shop info out of the way, let’s jump into the layout that I made! Jody sent me a box of supplies from her store. You can find the video of my kit share here. I really loved the fringe idea and I’ve been seeing a lot of layouts where people have been doing the embellishing with the same color in a big group so I decided to adapt both of these ideas and make my own layout. I love the end result! Since this is a photo of boys, I tried to stick with more boyish colors, but I did sneak a bit of pink in there. Since their cabin name was themed around Mario Brothers I had wanted to use red, but I have been trying to use up my Citrus twist kits from the past few months so I decided to use the pink ‘Fancy Free’ paper. I really love it with the other colors! I kept the layers behind the photo simple because the fringe papers were already so busy, I didn’t want there to be too much going on behind the photo. I added the doily to the top and bottom, but I’m not really sure if I like it. I might change my mind and take them off before I put them in my album. For each layer of color I picked out a few different embellishments to go along with the sequins. When I first started the layout I had planned on just using the sequins, but once I got done adding them to the papers I wanted to add a little more embellishments. I really love how they turned out! I think my favorite layer is the yellow and then green! I had the most pink embellishments, which surprised me! I am glad I was able to add so many! My son, Jonas, is on the right of the photo. He was the youngest kid in his cabin, but the boys rooming with him were video game/Mario fans too so that was fun for him to be able to bond with them over their interests. I was a bit worried about sending him to camp with all older kids in his cabin, but it worked out great! Thanks for stopping by and joining us for the fun today! Make sure to hop along and comment on the posts to be entered to win the awesome prizes Jody has set up for you! You have through July 31st to comment and enter. Sharing on social media will also earn you an extra entry. Just leave another comment letting us know where you shared the blog hop event. Super easy and so much fun! Now, you’ll be heading over to Sarah’s blog. Enjoy the rest of the hop!! LOVE LOVE LOVE THIS Megan and welcome to the Sparklers! I’ve so happy to be creating with you for this term! You fringed LO is amazing, I love everything about it! This layout is absolutely gorgeous!! Gorgeous layout! Love the fringes and how you placed the embellishments. Meg. W.O.W. That fringe is SO Gorgeous!!! This layout is stunning! Love this layout, Megan! The fringed papers are so cute and I like that you added little touches to them in the same color. Beautiful! These colors make this layout! Love it! I love the fringe! I haven’t tried this yet and need to! Those sequins really add to the fringe. Love your layout. I love the fringe! Congratulations, can’t wait to be creating with you 🙂 Beautiful work!! I love how you color matched each level, great idea and cute layout!! Love all the fringe Megan!! And All the color matching embellishes!! Really makes this layout so much fun!! Congrats on making the DT!! Megan I love your layout! Pinterest is the best! 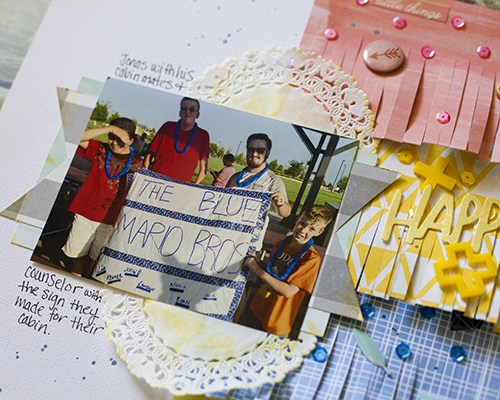 Love how you used the sequins as an added interest on the same coloured pattern paper! Love all the fringes and the vibrant colours. Fantastic scrap-lift! 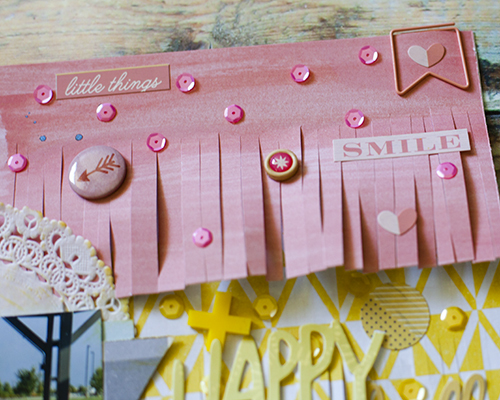 I love how the fringe gives movement and texture to the whole layout, and all the embellies you could use for each colour! Those colors and the fringe are WONDERFUL!!! The sequins are a perfect addition. That fringe is simply fab! Love how you incorporated it into your layout. Sequins and fringe are literally my two favorite trends right now! Gorgeous! And congrats on making the team! This is amazing!! 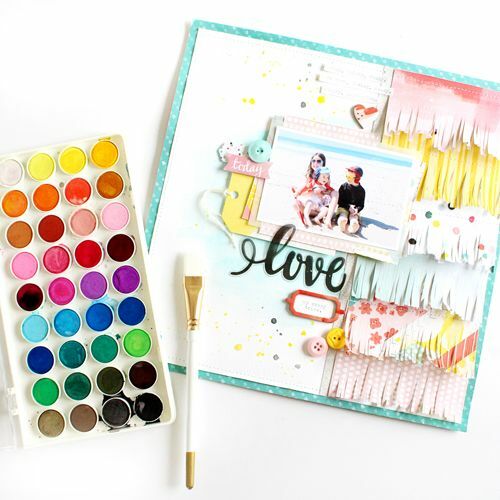 Love your layers and colours to create this beautiful layout! 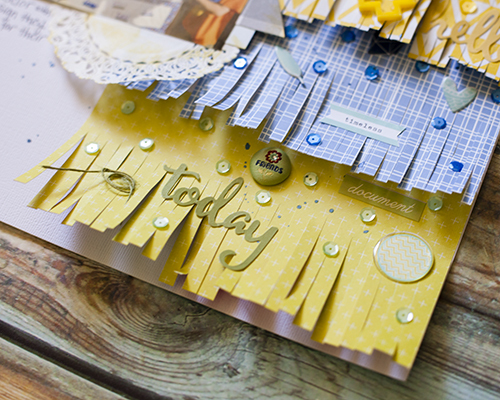 Great layout….the detail is so fab!! Congratulations!! Great layout….thanks for sharing….thanks for making this hop so much fun! !